Another sun kissed hazy morning. I’ve begun to wonder if that might be the real difference between New Delhi and Jaipur. Closer to the Himalayas, New Delhi is at an immediate disadvantage simply by being colder. It’s a well known fact that everything always looks better when the sun is shining. Ok, maybe not cowpats but nearly everything. Plans for the day? 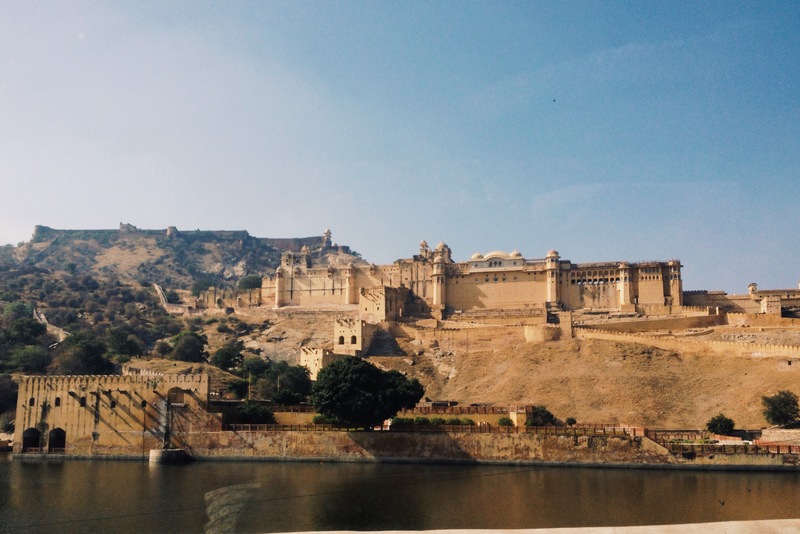 The morning is to be spent exploring the Amer fort, the afternoon is potentially going to take us out of the city to a monkey temple. Driving out to the fort was pretty eventful. We’d been surprised to pass Elephants in the city while checking out the palace, we now had a good idea of where it was that they had likely come from or where going to. It would appear that you can take an Elephant up the surrounding hills to the gates of the fort itself. This wasn’t going to be our mode of transport for the journey up hill, Raj pulled into a side street and seemingly from nowhere two battered grey jeeps pulled up to drive us the rest of the way. 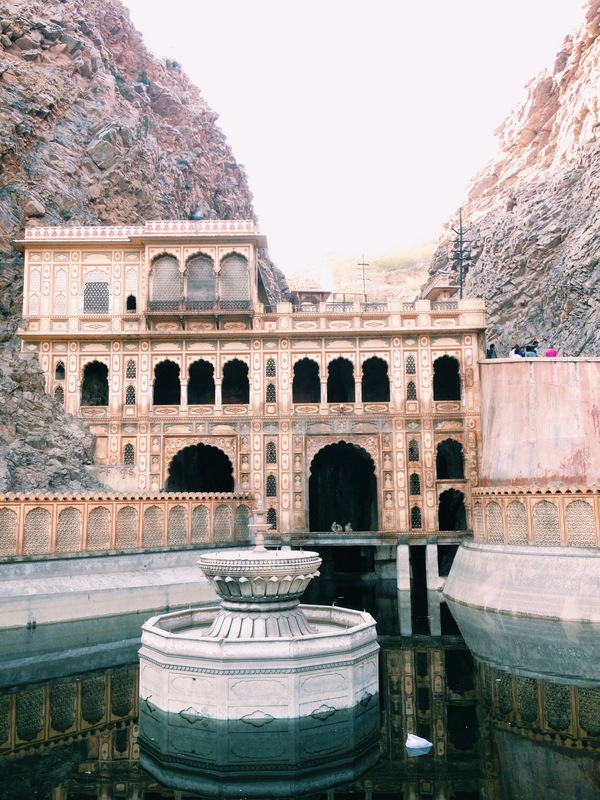 The bumpy, rickety ride led us past pigs foraging in the rubbish, young men washing themselves under water pumps before we stopped unexpectedly for a quick look around a Hindu temple. It didn’t take me all that long to realise that while in India the sky was rarely going to be punctured by rising church spires. 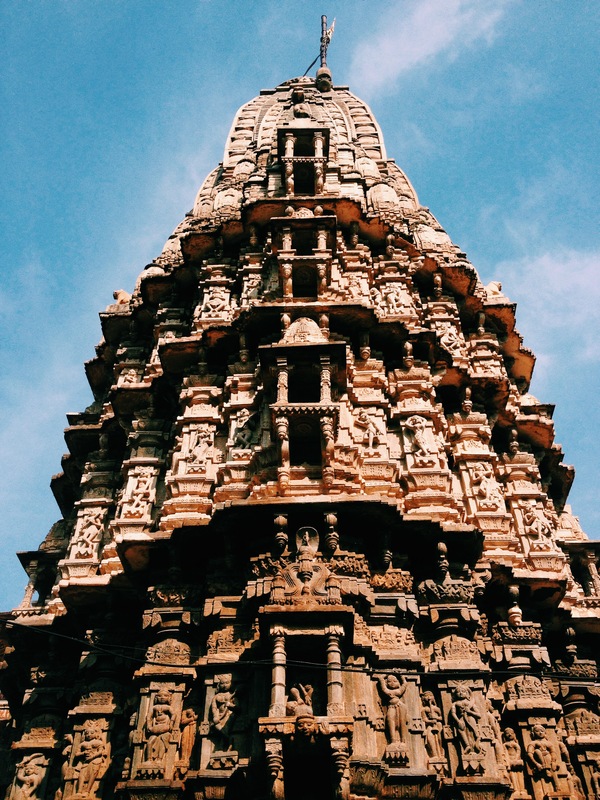 Instead, gloriously carved temple towers can be spotted almost everywhere. After a short stretch of the legs, we boarded the jeeps to continue up to the fort. As we climbed higher, the town of Amer fell away, the rising hills were covered with sprawling lengths of ancient walls and watch towers. As we twisted onwards, we eventually came to the entrance to the fort. After some general milling about, giving the local hecklers plenty of time to be told no seven times to their turbans, books, maps and paintings, we had our tickets, began to head inside and immediately took a wrong turn. I think we had managed to find ourselves in what may well be Jaipur’s most expensive restaurant. Fortunately they had two sections, standard dining and the silver service, which once we’d gone inside the waiting staff insisted that we simply had to see. Maybe they thought seeing it would either make us so utterly famished we’d have to eat there, or the idea of so much silver would persuade us in to parting ways with our money anyway. Fortunately everyone agreed that it was just slightly outside of what we’d budgeted for and made our way into the fort for real. We began together, our group of nine but once the staircases and passages began to open up it didn’t take long for us to separate. One inside a tower, climbing higher and higher, at one point you thought you were behind Jagdeep, or Gary was following you up, then as you reached the wall-walk you’d lost everyone. Elena and I managed to stick together and conducted a pretty thorough exploration of the first courtyard, finding a waterwheel, descending a staircase until the darkness became so intense we thought it’d be best to make a hasty retreat to take one that would lead us out into the light again where conveniently we managed to run into the rest of our group. It turned out that we’d all had a pretty similar experience. 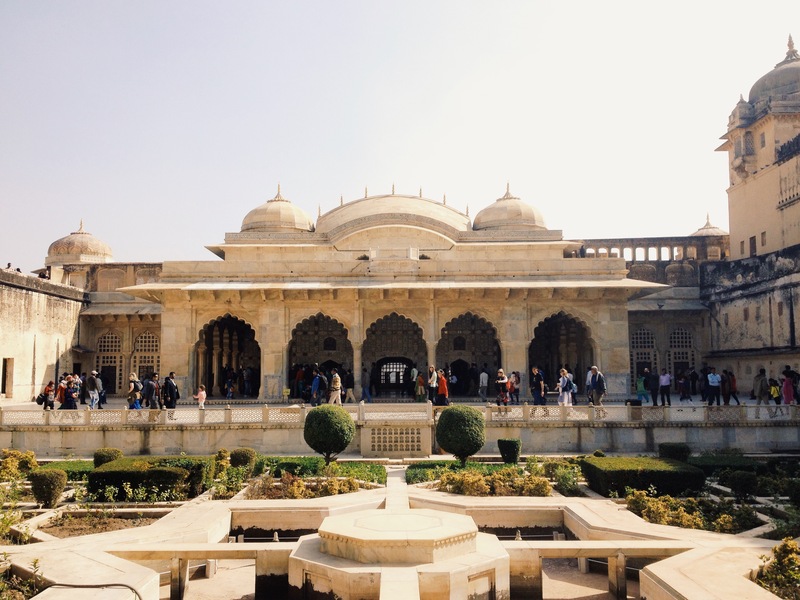 After a quick run through some of the rear passages, gardens and courtyards everyone felt that we’d seen enough of the Amer fort. We took lunch near a lake, the setting was almost perfect. The rolling mountains, the pink-orange of the stonework, a light fog. If it wasn’t for the ever present stench you could be forgiven for thinking that you’d found yourself somewhere in Southern California. 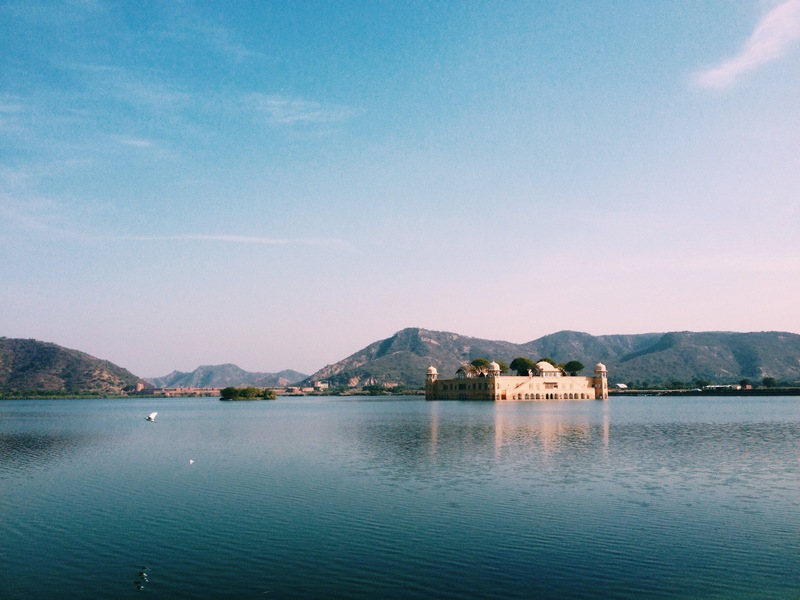 Across the water from us was another of Jaipur’s gems, the Jal Mahal. I don’t know how it came to be. It looks like someone has built a wall around an island, the walls slide straight into the water. Part of me wondered if it was there before the lake. I’m not even sure if it’s possible to go out there to investigate it for myself. Regardless of it’s conception and delivery, it’s a spectacular sight. Next on our list for the day was the monkey temple. I was, prior to arrival, a little bit anxious about having all of my personal belongings stolen by tiny little apes. On the way there there were plenty of things to see that were going to keep my mind focused on other things. This side of the city was very poor. Where the poverty in New Delhi was blatant, scattered, depressing, here at least the people had built small homes, shops, lives. They looked significantly more content with what they had. The children played, I’ve never seen so many kites in the sky, they smiled, waved as we passed. 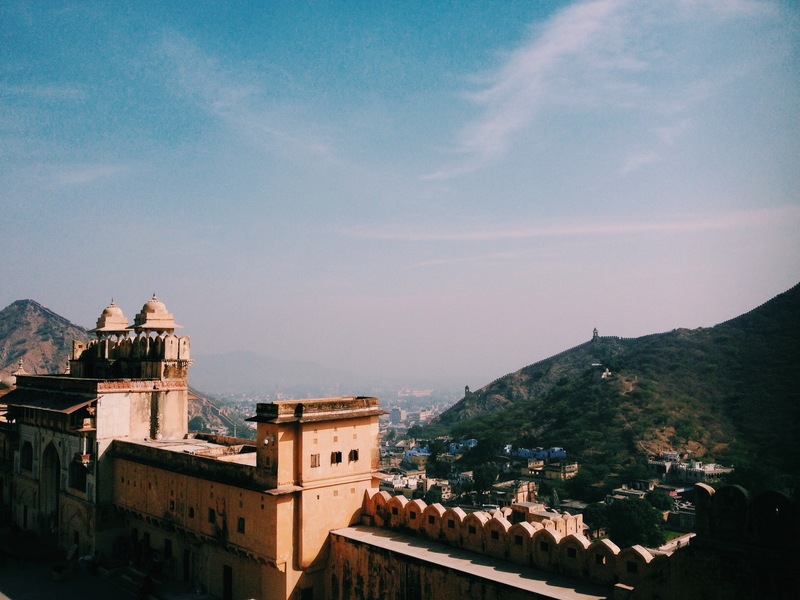 There appears to be more pride, more ambition in Jaipur. This is not nearly an unpleasant, confronting place as New Delhi. Just like that we were out of the city. Perhaps another factor in Jaipur’s appeal. It’s much smaller than New Delhi. We drove past slowly eroding columns and arches. Small, rural villages, cheerful locals, herds of cows blocked the road. The almost ever present sound of the car horn now replaced with bird song. In the bushland either side of us peacocks scratched away as numerous as chickens. The hills folded in towards us, rising away steeper as we climbed higher into them. Occasionally Raj would stop, throw open his door to make sure we were heading in the right direction. The answer was always in the affirmative, accompanied by a hand gesturing the turns we’d have to take along the way. When we reached the monkey temple it was quiet. I had expected this to be a tourist hot spot and literally teeming with monkeys. As we edged further in, the monkeys began to become more numerous. They were, much to my relief, very relaxed. They hardly noticed us as we stopped to take photos, or just watch them eat, play and groom one another. While we were there I must have compared it to the ancient ruins of the Jungle Book a thousand times. The buildings were built into the valley, climbing up to the peak. There must have been a natural spring somewhere towards the top as water flowed down through channels and pools. In the centre of the complex was perhaps the largest of the pools, four monkeys were grooming each other on a ledge over the water. You could walk a narrow pathway down the side for a closer look. Most of our group were moving bak away as I went out. It was only as Jackson’s hand slammed into my back as the other simultaneously grabbed me that I thought of how funny it would have been to do that to somebody else. It was at times a little creepy. Red, scrawled Hindi text appeared on walls. Could it have been written in blood? A stark warning that if you don’t have a photography ticket and take photos you’ll be fined 500 rupees. 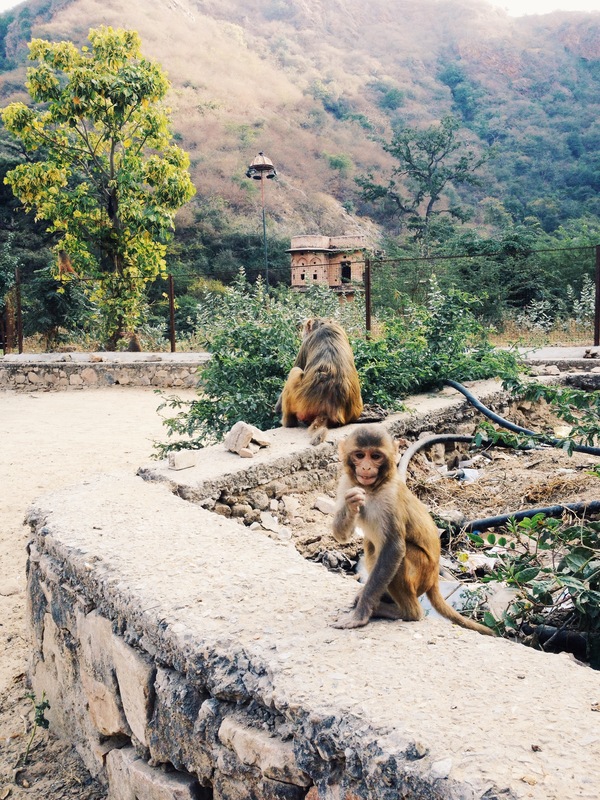 The only time I found myself to be slightly concerned by the monkeys was as I took a photo, I had stood too close to a wall, one darted across in front of me in a blur or brown. I jumped a strong mile. Once we’d reached the top, we turned and made our way back to the bus. It had been perhaps the best day of our trip so far. That lake shot is fantastic!